This chapter describes a method to quickly and accurately predict 3D positions of body joints from a single depth image, using no temporal information. We take an object recognition approach, designing an intermediate body parts representation that maps the difficult pose estimation problem into a simpler per-pixel classification problem. Our large and highly varied training dataset allows the classifier to estimate body parts invariant to pose, body shape, clothing, etc.. Finally we generate confidence-scored 3D proposals of several body joints by reprojecting the classification result into world space and finding local modes of a 3D non-parametric density. The system runs at around 200 frames per second on consumer hardware. 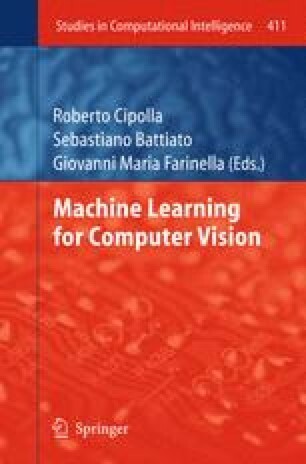 Our evaluation shows high accuracy on both synthetic and real test sets, and investigates the effect of several training parameters.We achieve state of the art accuracy in our comparison with related work and demonstrate improved generalization over exact whole-skeleton nearest neighbor matching.